EOS Knights — Save the village from the goblins! Collect materials and craft the items your Knight, Archer or Mage will need to defeat the Goblin army. Trade materials and items in the marketplace. Choose a pet from 24 adorable companions. All player actions are performed on smart contracts and data is stored securely in the EOS blockchain. EOS Knights is available for Android, iOS and on the web. So what are you waiting for? Go save a village! Game Review: An Introduction to EOS Knights. Over the past few months, we've seen an increase in blockchain gaming and its adoption. This is because blockchain games offer real and valuable incentives and collectibles that one can exchange for money unlike a lot of non-incentivized games. 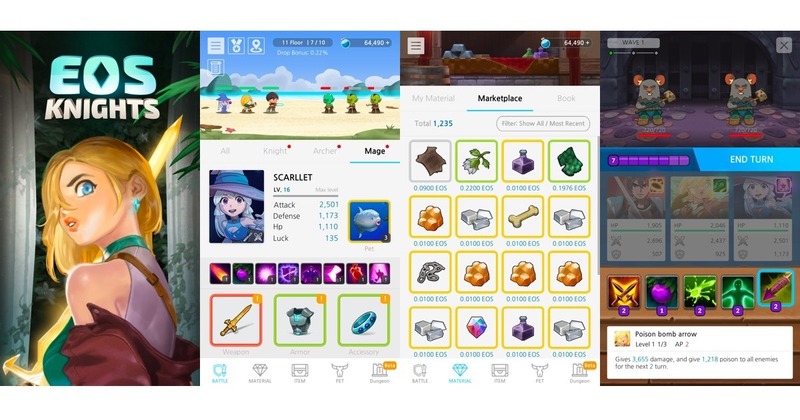 Last time I made a review about this game, I was yet to actually give it a test run, due to the fact that it needed you to hire a champion for a battle to commerce and I think I just got myself addicted to the game EOS Knights. So, a review of a game that isn't from the STEEM blockchain, namely EOS Knights. This is a game that I've been playing for a while now, and it is the classic idle game... in that much of the action is timer based. You set your heroes off to do stuff, with minimal input from you... and several hours later (or minutes or less if you are impatient), you return to see what they have dredged up from the depths of the orc invasion. The game is based upon the beloved "freemium" model of gaming, however instead of earning and spending fiat... you are spending and earning EOS! Is it worth it to play? Will you be raking in EOS?